Recent Russian space rock explosion and same day close flyby of an asteroid is stirring up talk about dealing with the near-Earth object threat. In light of Earth's most recent brushes with asteroids, the Science, Space and Technology Committee of the U.S. House of Representatives is holding a hearing today (March 19) to assess what kind of threat space rocks pose. 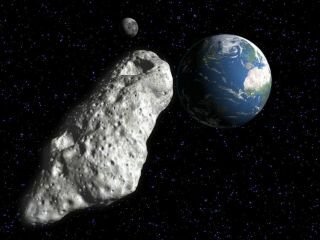 The first in a series of meetings, "Threats from Space: A Review of U.S. Government Efforts to Track and Mitigate Asteroids and Meteors, Part 1," will examine ways in which the government — with help from agencies like NASA and the Air Force — can help protect the Earth from dangerous asteroids that could impact our planet. Today's hearing will begin at 10 a.m. EDT (1400 GMT), and will be streamed live online. You can watch the asteroid threat House hearing on SPACE.com, courtesy of NASA. "Today’s events are a stark reminder of the need to invest in space science," Rep Lamar Smith (R-Texas), chairman of the Science, Space and Technology committee, said in on Feb. 15, when a meteor exploded over Russia on the same day that a large asteroid buzzed close by Earth. On the same day, a smaller, previously undetected meteor exploded in the sky over a populated part of the Ural Mountains in Russia. "An unforeseen meteor (estimated 50 feet in diameter) exploded in the sky above the Russian city of Chelyabinsk releasing the equivalent of a 300 kiloton bomb, about twenty times the explosive energy of the atomic blast used over the city of Hiroshima," congressional officials wrote in the hearing's charter. Do we have the tools and technology necessary to detect and track near Earth objects? How often do we currently observe large meteors entering the atmosphere safely over the ocean? Are we tracking the right size objects, specifically the ones that can cause significant harm on Earth? Once we identify an object, what are our means of tracking it? What are our contingencies and mitigation capabilities if we determine there is a threat to the Earth from a NEO impact? What process exists among government agencies, both foreign and domestic, in such an instance? Three experts will take questions during the hearing. John Holdren, the director of the Office of Science and Technology Policy in the White House, advises President Barack Obama on issues related to science and technology. Gen. William Shelton, the current commander of the U.S. Air Force Space Command, and NASA administrator Charles Bolden will also address the committee. NASA's Near-Earth Objects Program Office at the Jet Propulsion Laboratory in Pasadena, Calif. is responsible for investigating many of the meteors and asteroids that could pose a threat to Earth. "Basically, our office takes observations from astronomers all over the world and computes their orbits and then tracks their motion about 100 years into the future to see if there is any interesting close Earth approaches for comets or asteroids," Don Yeomans, the director of the NEO program told SPACE.com during a video interview. A second congressional hearing will focus on international efforts to survey the sky for asteroids and meteors, but organizations like the United Nations are calling attention to issues involving the detection of near-Earth objects today as well. After the destruction in Russia, the Action Team on Near-Earth Objects of the United Nations Office for Outer Space Affairs, led by Sergio Camacho, proposed the formation of an advisory group that would monitor dangerous near-Earth objects. "Mr. Camacho’s team, also known as Action Team 14, recommended the formation of an International Asteroid Warning Network (IAWN), which would pool together the expertise of the world’s many existing scientific agencies and organizations to discover and track objects and generate early warnings of potential impacts," United Nations officials wrote in a statement. Follow Miriam Kramer on Twitter @mirikramer and Google+. Follow us @Spacedotcom, Facebook or Google+. This article was first published on SPACE.com.